Harry Hazel Culver was born on January 22, 1880, in Milford, Nebraska.Â Â The middle child of five, Culver was raised with three brothers and a sister on the family farm.Â His father, Jacob H. Culver, was a National Guard Brigadier General who played an influential role in his sonâ€™s life.Â Not only did he follow his father into the military, enlisting at age 18 to serve in the Spanish American War, but he later founded the Pacific Military Academy in his fatherâ€™s honor. 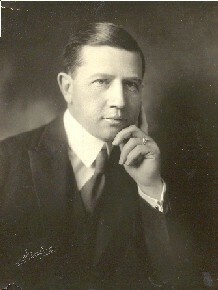 Prior to earning a reputation as a real estate developer, Culver studied business at the University of Nebraska for 3 years.Â Then, from 1901 to 1904, he lived in the Philippines, where he worked in the mercantile business, as a reporter for the Manila Times, and as a special customs agent.Â He returned stateside to Customs special duty in St. Louis and Detroit, but resigned in 1910 to move to California. Once in California, Culver worked for real estate developer Issac Van Nuys. After filing the original incorporation papers of Universal City, Culver announced his plan for a new city halfway between Los Angeles and the beach resort, Venice.Â In a speech at the California Club in Los Angeles, Culver described his vision for the location, which would later become known as Culver City. Culver sold Hal Roach the property on 8822 Washington Blvd. for the Hal Roach Studios, which operated from 1919 to 1962.Â Culver City has also been home to Cecil B. DeMille’s studio, MGM Studios, David O. Selznick Studios, RKO and Desilu. Culver served as the president of both the California Association of Realtors and the National Association of Realtors.Â In 1924, he moved his offices to the second floor of newly opened Hotel Hunt, now named the Culver Hotel, the venue for the filming of â€œThe Wizard of Ozâ€ and â€œGone With The Wind,â€ in 1939. Culver served locally in elected office and took every opportunity to promote the city, holding events like picnics, leading tours with box lunches, and advertising “All Roads Lead to Culver City.”Â He also donated the first acreage for Loyola University and founded the nearby Pacific Military Academy in honor of his father.Â At age 66, Culver died in a Hollywood hospital after a number of strokes. On March 26, 2006, Culver City’s Cultural Affairs Division with the Culver City Historical Society dedicated a sculpture of Harry Culver, commissioned to artist De L’Esprie with the National Heritage Collectors Society, founded by David L. Spellerberg. The artwork, titled “A Moment in Time,” is part of the city’s Art in Public Places program. Culver’s grandson, Dr. John Battle, and his family participated in the dedication ceremony.